Empire just wasn't doing it for me. Ive started that army at least a half dozen times in the past 10 years, I should take that as a hint that its just not for me. 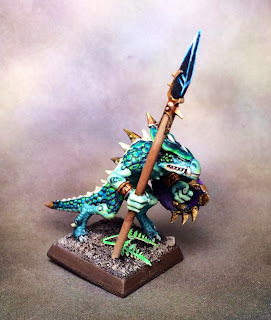 So here is the beginning of my Lizardman army. I absolutely love the background of the Lizardmen, and almost view them as the Demons of Order. Im aiming to have 1200 points painted in time for the Adepticon Team Tournament. A worthy switch of interests! Fabulous brushwork. Love the obsidian blade look! do they drive an icecream van? Very nice paint job! The transitions from blue to green to white are really well done. 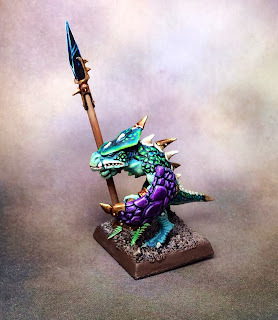 An entire unit painted like that would be awesome. An entire army ... incredible. 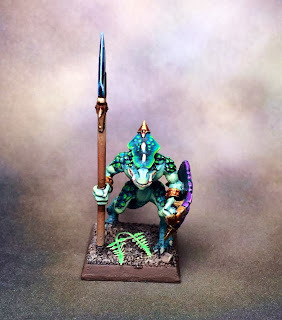 Great colour scheme, one of the better lizard schemes I've seen in a while.